WWJE? what would jesus eat? That`s what Jesus eats, so eat it too! I Don't think this is a fail for McDonald's, maybe for Jesus' arteries. Isn't gluttony a deadly sin? Jesus. 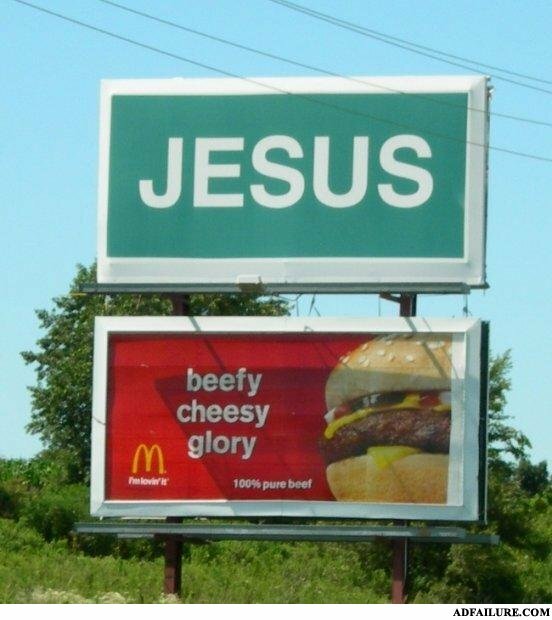 He's beefy, cheesy glory. I missed this chapter in the Bible. Mcdonalds quarter pounder with cheese , spreading christianity one sloppy heart attaack at a time. hahaha, I love this... Aha I don't know what else to say. His Response: Ey don't laugh it's better than eating bread! Bask in his beefy, cheesy, glory! Jesus has got juicy meat and great buns. What does society have in common with laundry? They both get ruined when you mix colors with whites. -Yeah, but now that you're here, I think I'll find another bar.